Toxic plastics in your front and back yards. Toxic plastics may be found in a large number of items in your front and back yards. Toxic plastics are not found only inside your home. They are also found in abundance just outside your home – in your front and back yards. - Plastic handles on garden implements. - A plastic garden hose. - Plastic toys, for children and pets. - Plastic on a swing set. - Plastic pool or paddling pool. You can probably think of a few other items I may have missed. The thing about these plastics – and we touch them repeatedly – is that few if any have a recycling number on them. In other words, we don’t know what kind of plastics they are, or whether or not they are safe. Now step out into the front yard, or think about what you are touching as you take a short trip from home. If you are cycling, you are almost certainly gripping plastic on the handlebar. If you take a long ride, you are gripping that plastic for hours. Or maybe you take the car. Think of the plastics you touch. The door handle, the seat, the steering wheel, the gear shift, the emergency brake lever. In fact, pretty much everything you touch in your car is made from plastic. As with our experience in the back yard, the problem we face with the plastics we touch on our bikes and cars is that we have no way of knowing what they are, or whether they are safe. With some items, like garden implements, garden furniture and outdoor toys, we can make a choice to buy products made from alternative materials, like wood or metal. With other things - the inside of our cars, for instance - we really don’t have any alternatives to choose from. 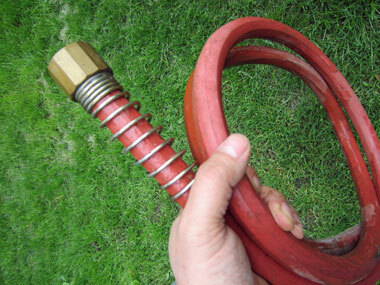 For your garden hose, you can buy a phthalates-free, polyurethane hose from Water Right at Amazon.com . For garden furniture, you can buy wood furniture either locally or through Amazon.com .